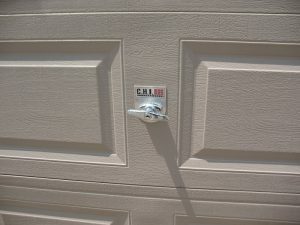 Garage door locks are normally installed in the center of the section just above the bottom section. 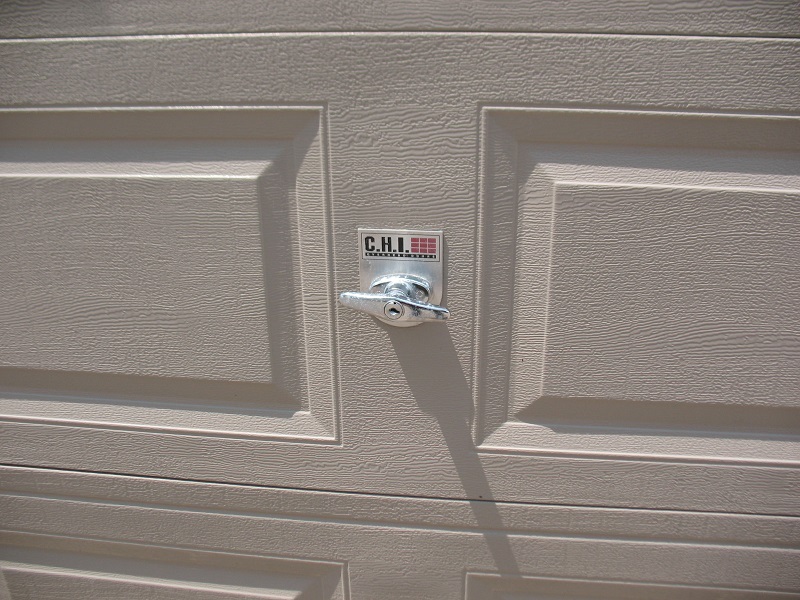 Here are instructions on how to install the two most common lock assemblies we sell. 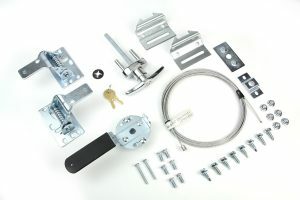 The more common lock assembly uses a cable to connect the outside lock keyed T-handle to the spring latches. The cable runs from the spring latch on one side through the center inside release handle and on the other side where a track bolt and nut secure the cable to the spring latch. On single car doors there is often only one latch. The other system uses two sash chains and small S-hooks to link the inside handles and spring latches. If you have a foam-filled door with steel on both sides the metal on each side will compress when you tighten the screws that secure the outside handle to the inside handle. To prevent this from happening you will use the two red spacers above. The order of installation is as follows. I. 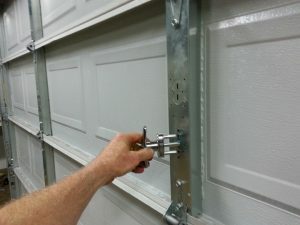 Install the outside keyed handle and the inside release handle. Drilling for the lock will be a two-step process. 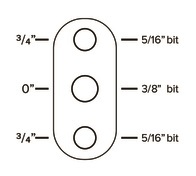 First, three holes will be drilled with 3/16″ bits. This is key to a properly aligned and functioning lock. After drilling these holes, larger 5/16″ holes and a 3/8″ hole will need to be drilled on the outside skin of the section only, but not on the inside. Sometime the 3/8″ hole needs to be enlarged slightly. Most steel doors are either pan doors with stiles joining the edges of the sections, or sandwich doors with steel on both sides bonded to the insulation. 1. 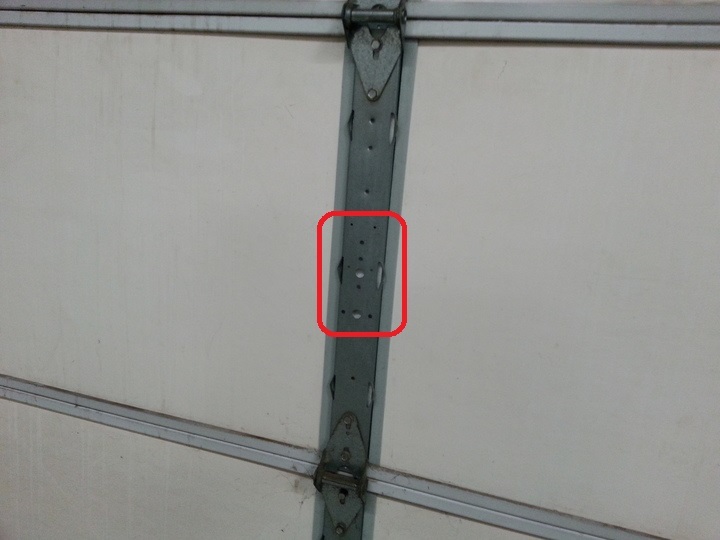 If you have a pan door, locate the center stile and the holes punched for the lock. These may be centered, as you see in this insulated pan door . . .
or slightly below center, as you see in this hollow, or non-insulated door. Notice how the lock lines with the holes. 2. Drill three 3/16″ holes from the inside using the holes in the stiles as a guide. The drill bit must be centered in the holes and perpendicular to the section and stile. Check the outside of the section to make sure the holes are evenly spaced. 3. Drill the three larger holes in the outside skin only of the door. Faster speeds are better because slower speeds tend to rip the thin sheet metal. 3. Insert outside lock T-handle. 4. Install the inside release handle. 5. 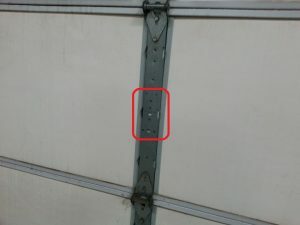 Install the two long screws that connect the inside and outside handles. 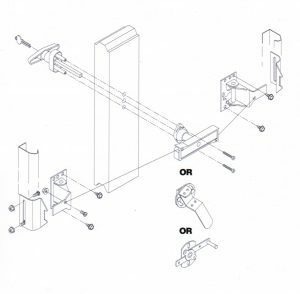 Locate the outside stile where you want to install the lock. This would normally be in the center of the section. On odd-size doors it will be off centered. 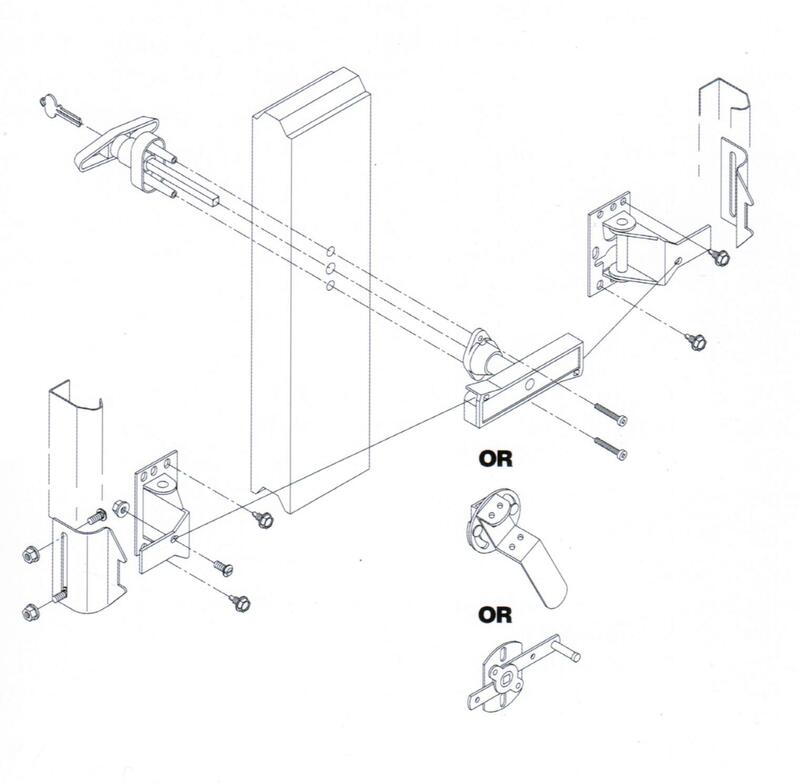 The outside T-Handle can be installed vertically or horizontally as shown below. 2. 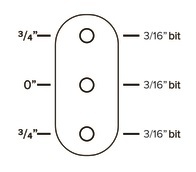 Drill three 3/16″ holes from the outside and into the inside skin of the section. The drill bit must be perpendicular to the outside of the section. After drilling, check the inside of the section to make sure the holes are evenly spaced. 4. Cut the red spacers so they are flush with the outside skin of the door section and install them over the two posts that go into the 5/16″ holes. Insert outside lock t-handle. 5. Install the inside release handle. 6. 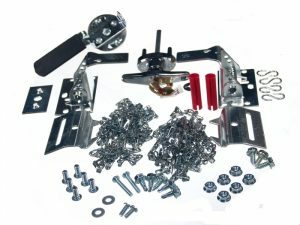 Install the two long screws that connect the inside and outside handles. II. Install the spring latches in the center at each end of the lock section. 1. Screw the the latches to ends of the sections. 2. Connect the latches and center release handle with the cable or sash chains. Pull them to tighten them. The lock will not work if the chain or cable is loose. 3. Test the outside lock handle. If the latches don’t pull when the handle is turned, remove the inside handle and turn the outside T-handle 90 degrees. III. Install the lock strikers. 1. 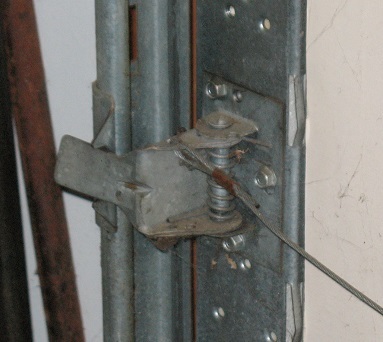 With the door closed align the striker with the spring latch and secure the striker with two track bolts and flange nuts. 2. Drill additional holes as needed. 3. Test the lock to assure it works. 4. Lubricate the latch and inside release handle. Here’s how the striker and latch align. Some installers bend the latch to get better traction.